The Green Seal Certification Program provides summer camps with an opportunity to publicly commit to incorporating sustainability into their activities and operations. Joining the program is easy, and support is offered by the Office of Sustainability at each stage of camp planning and execution to help you earn your certification. There are four levels of certification: Bronze, Silver, Gold, and Platinum. Our goal is to encourage all summer camps to join the program in 2018, and we hope to award Gold certification to 50% of our camps! Camp coordinators work with the Office of Sustainability to create goals based on the general guidelines set out below. To qualify for the program, each camp must have at least one recycling bin conveniently available for use by campers and volunteers (existing campus recycling bins count towards this requirement, and additional bins can be requested from the Office of Sustainability). Each camp that participates and is awarded Green Seal Certification at any level will receive a certificate and will be recognized on the Office of Sustainability’s website and social media pages. The guide can be viewed online on this page or downloaded in handy PDF form at the link below. Contact the Office of Sustainability Intern to sign up for the program. You can also get in touch at any point during the summer if you have questions, concerns, or require support to follow through with a commitment. Decide what level of certification you would like to pursue (Bronze, Silver, Gold, or Platinum), and create a list of specific commitments you would like to achieve to reach this goal. Every camp is different, and some commitments can / must be adjusted to accommodate specific activities. Work with the Office of Sustainability Intern to customize your camp’s commitments and adjust them to meet your needs. In your pre-camp communication with parents, you are encouraged to mention that the camp is participating in the Green Seal program. Some goals specifically require communication with parents, and the best time to do this is before the camp begins. Feel free to keep in touch with the Office of Sustainability and the Office of Sustainability Intern over the summer. If you have questions, concerns, or require any kind of support to reach your goals, let us know! Platinum: Over 25 actions taken, including all 7 categories. There are 7 categories in total, and each comes with a checklist of actions that can count towards certification. Many of the actions are things that already happen at your camps, and the Office of Sustainability wants to recognize your efforts! Once you have chosen a certification goal for your camp and decided on which actions you will pursue, the implementation of those actions is up to you. Every camp is different, so actions can always be modified or added to the list to recognize sustainable practices in the camps. To modify/add an action, contact the Office of Sustainability. When you are ready to obtain your certification, please fill out the Green Seal Calculator form (downloadable below or in the resources section) and send it to the office at sustainable.engagement@usask.ca. The Office of Sustainability offers many forms of support for summer camps looking to increase the sustainability of their operations. From informational and educational support, workshop opportunities, facilities support, or initiative funding through office grants, the Office of Sustainability is there for you every step along your sustainability journey. 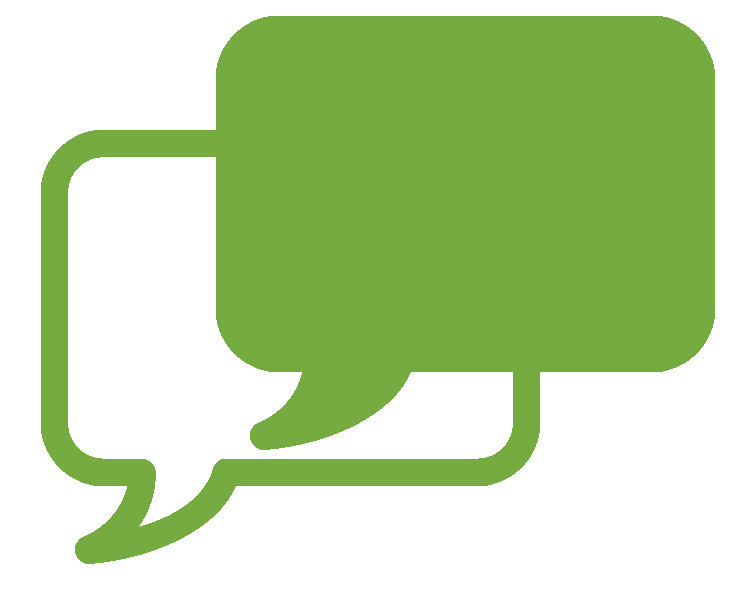 If you would like to learn more about Office of Sustainability resources and support, please e-mail us directly at sustainable.engagement@usask.ca. Would you like to explore the U of S campus with your camp group on a walk that discovers the hidden world of sustainability going on around us every day? You're in luck! The Office of Sustainability offers Campus Sustainability Tours for free to interested campus groups. If you are interested in booking your tour, please contact our office directly at sustainable.engagement@usask.ca. To learn more about the tours themselves, click the link below. If your camp group is in need of additional support in terms of waste, recycling, or composting, our office's Waste Prevention Co-ordinator would be happy to help. Please contact them directly for more information. This guide is a comprehensive tool intended to help organizers make summer camps environmentally sustainable. It provides information on incorporating green concepts at every stage of camps of various sizes. It is also the guideline for the Green Seal Certification system. Use these checklists to begin making your camp green and earning your Green Seal Certification! Remember that to pursue certification, you must fill out the fillable PDF checklist form and submit it to the Office of Sustainability at sustainable.engagement@usask.ca. All of the planning materials you might need can be supplied or supported by the Office of Sustainability. The Office of Sustainability Intern is always available to help you choose actions, make commitments, and follow through with those commitments. At any point in the planning process, feel free to reach out for assistance. Our goal is to support your camp in its journey to become more sustainable! This checklist exists to get your team started on the right track as soon as possible, even before the program has begun. This checklist also includes items that can be useful for any office space looking to be a little more sustainable. Minimize paper usage. Communicate digitally whenever possible using email, web content, or by phone. Print smart. Carefully consider everything you print and be thoughtful about your decisions. Ensure that paper products have a high proportion of postconsumer recycled content and are FSC certified. Consider ENERGY STAR® rated photocopiers, laser printers with duplex capability, and to plain-paper fax machines. Avoid disposable dishes, cutlery, straws, stir-sticks, napkins, etc. Buy coffee, cream, sugar, mustard/ketchup packets, snacks, etc., in bulk. Avoid single-serve containers. Use coffee filters made of reusable cloth, steel, or unbleached recycled paper. This checklist addresses basic organizational tasks such as registration and readying the facility for the undertaking of a successfully green camp. Consult the university’s sustainable purchasing guide. This checklist gives various waste reduction tips and ensures that the day to day operations of the camp are sustainable. Reduce paper waste at registration and check-in (ex. short registration forms, computerized systems). Great a recycling plan for the duration of the camp. On a DAILY basis, remind campers, volunteers, and employees of waste reduction and other environmental opportunities and thank them for their help in making the camp sustainable. Ensure a sufficient number of recycling bins that are conveniently located, well-marked, and large/diverse enough to accommodate the expected type and amount of waste. Ensure presentations are environmentally friendly. Ensure that exhibit components are reusable and produced sustainably. This checklist addresses the importance of waste-free lunches and other sustainable goals for provided food services. This checklist applies to all travel for participants, organizers, and contracted services. Establish an idle free-zone around the camp venue. This checklist should be consulted while procuring goods and services for an event or the camp in general. Once a product seems ready to throw away, try reusing it in different ways extend its life cycle, then recycle. This checklist is provided to help refine your camp's sustainability program for future years and to ensure the satisfaction of all who contribute to the sustainability effort. It is important to involve the parents of your camp attendees in the transition towards sustainability at your camp. Below is an example letter that can be sent to parents to make them aware of your efforts and to gain their support in the transition. This letter can also be found in the full Green Seal PDF Guide. 1. Gather all the scrap papers, it’s better if they’re all of the same size. But you can keep the paper sizes random if you wish to. 2. Stack 4-6 papers together nicely and punch holes on them using the paper punch. 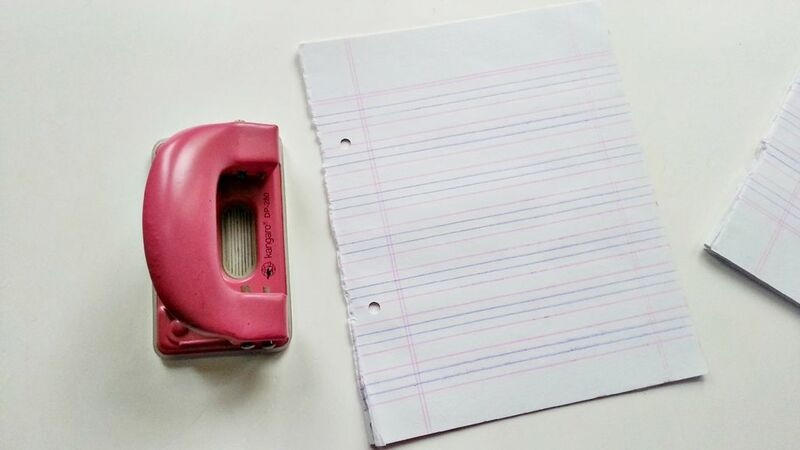 Repeat with another small stack until all of your paper is hole punched. 3. Once you’ve punched enough papers for the notebook you’ll need to make the cover pieces. Unfold the cereal box and lay it flat on a flat surface. 4. 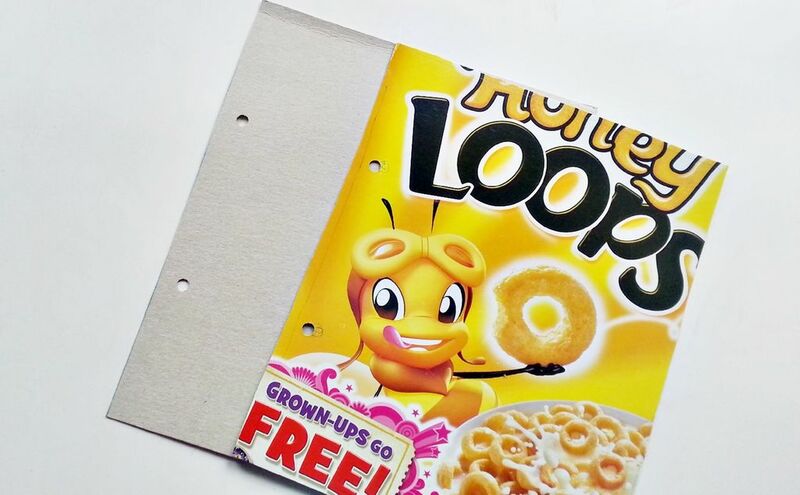 Place a sheet of punched paper on the cereal box and trace around the sides of the paper on the cereal box. 5. 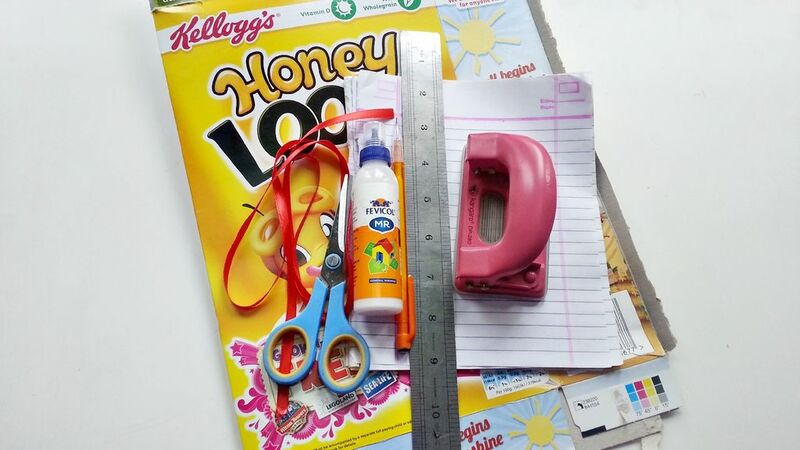 Cut out the traced parts from the cereal box. You will need to 2 pieces (front and back). 6. Place and line up the back piece and front piece together, insides together. Mark the areas for the holes and punch holes on them. Cover pieces are ready! 7. Optional: Use duct tape to create a spine. Place a piece of duct tape about 1 inch longer than the covers and lay it sticky-side up on a table. Carefully line up the punched-edge of the covers with the tape so that they are centered (about 0.5 inch excess on top and bottom). Attach the covers to the duct tape, but do not cover up the punched holes. Cover the sticky part of the tape with another strip facing the opposite way. 8. Cut a long piece of ribbon (long enough to tie a bow knot). Insert the ribbon through the holes on the back piece of the cover. Insert it from the outside towards the inside. Now attatch all the punched scrap papers through the ribbon. Finally, draw out the ribbon through the front piece of the cover. 9. Tie a bow and it’s done! Enjoy!